One of my new year resolutions was to drink more water/juice as the recommended intake of water is between 2 to 3 litres everyday and some days I only have around 600ml which is no where near enough and probably why I have so many headaches. I was very kindly sent a product that has definitely been helping me drink a lot more from the lovely people at Monbento! 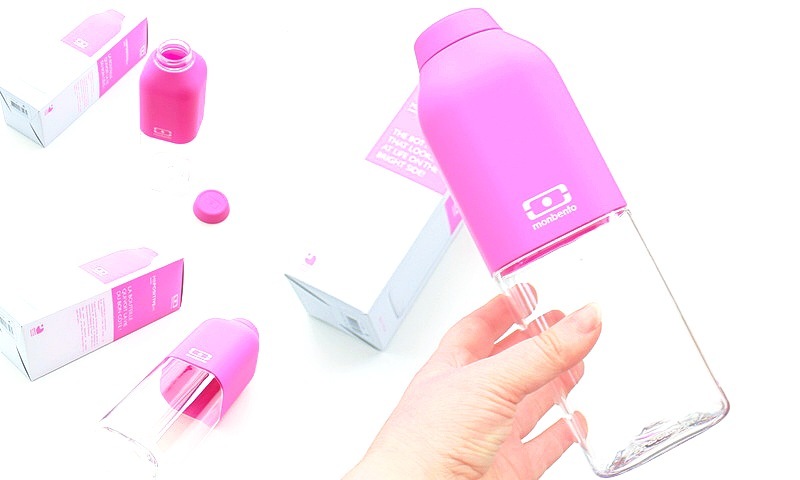 I have the *Monbento MB Positive 50cl Bottle (£12, Pink) which is the cutest drinks bottle I have ever seen! The bottle is BPA free, soft touch, air tight and it is NOT dishwasher safe. I chose the pink colour as it is so fresh and summery although the bottle also comes in grey, green and light blue. Firstly, I love the design, it is very summery and perfect for this time of the year when spring has sprung but the weather is still a bit gloomy and grey as it is most of the time in England. It makes a lovely bright, colourful addition to my desk and because of that I have been reaching for it more. The bottle hold 500ml of water, smoothie or juice which means that I only need to drink four bottles worth and I will have reached the necessary intake for the day! The bottle is great for juice, I have been drinking a lot of orange juice from it recently; I will be trying it with smoothies soon too. The bottle isn't suitable for hot liquids and it is also NOT suitable to put in the dishwasher but it is very quick and easy to clean. The pink half of the bottle, as well as the lid, is composed of soft touch rubber which is a nice touch to the design. From my experience so far the bottle doesn't leak at all and I don't think it will in the future. Have you tried any products from Monbento? Do you have any tips for drinking more? This looks super cute. I've always got a BPA free water bottle with me though I haven't come across this brand yet. I LOVE the look of this! I'm a sucker for cute water bottles and this is adorable! I drink water every day and have for years, probably not enough but i've always kept to it every day and it's a great feeling!